The USA is back in the Women's World Cup final after its best game of the 2015 tournament, a 2-0 win over Germany. Grant Wahl on the unwavering Carli Lloyd and the drama that unfolded in Montreal. MONTREAL — The U.S. played its best game of the Women’s World Cup and beat Germany 2-0 to advance to Sunday’s World Cup final in Vancouver. Thanks to a ruthless 69th-minute penalty kick by Carli Lloyd, a gorgeous second from Kelley O’Hara and some helpful officiating from Romanian referee Teodora Albon, the U.S. will play in the sport’s biggest game for the second straight time, either in a rematch of the 2011 final against Japan or against upstart England. There were plenty of heart-stopping moments, including a scary collision of heads in the first half between Morgan Brian and Alexandra Popp and a 60th-minute penalty miss by Germany’s Celia Sasic, in which she sprayed her spot kick wide left. And there were two big calls that went the U.S.’s way: One when Julie Johnston avoided what should have been a red card for a denial of an obvious goal-scoring opportunity, and a second when Alex Morgan appeared to be just outside the penalty box when Annike Krahn made contact with her, which set up Lloyd's winner. Give U.S. coach Jill Ellis a lot of credit for having the guts to go with one forward (Morgan) and three central midfielders (Lloyd, Lauren Holiday and Morgan Brian) for the first time in the tournament. All three central midfielders were more effective in their movement, passing and use of space in a U.S. attack that appears far less static when Abby Wambach isn’t starting. After appearing to settle back early and look for the counter, the U.S. started connecting on more possession, build-up play and chances. The Americans did everything but finish in the first half, with Morgan failing to convert two fantastic chances and German goalkeeper Nadine Angerer coming up big. The second half was a bit more even, but the U.S. did what it needed to win. Morgan isn’t in her sharpest finishing form right now, which is no surprise since she missed two months of action right before the World Cup with a bone bruise in her knee. But you have to admire Morgan for fighting through the frustration that came with two missed golden opportunities in the first half. Morgan herself admits she often overthinks things when they aren’t going well, and I thought it might be time to yank her early in the second half. And … I was wrong. Morgan kept taking on German defenders until she finally drew the disputed 69th-minute penalty from Krahn. Why the Germans didn’t realize Morgan always wants to go to her left is beyond me, but her persistence paid off in the end. You don’t want to get into a battle of wills with Morgan—at all. 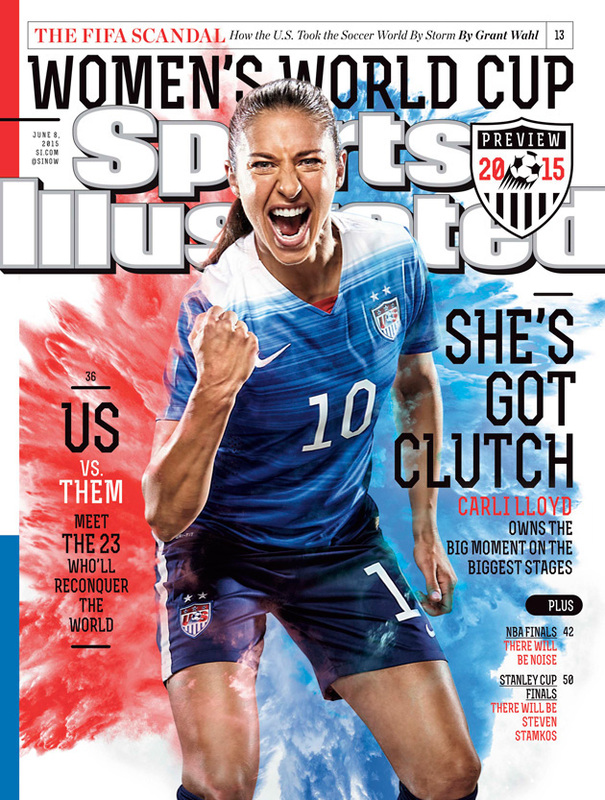 What can you say about Carli Lloyd? Ellis’s tactics in the last two games have given Lloyd the freedom to be a completely different player, one who constantly threatens defenses and frankly strikes fear into them. Basically, Lloyd has been given the freedom to be Big Game Carli again, the player who scored the winning goals in the 2008 and 2012 Olympic final. Lloyd took her second perfect penalty of the tournament on Tuesday, showing the poise that Sasic didn’t, and Lloyd’s remarkable run and pass in the box that created O’Hara’s goal was a thing of beauty. Those moments don’t just happen. That poise comes from thousands of hours of work in a New Jersey gym when you’re alone and nobody else is watching. And they’re paying off in a trip for the U.S. to another World Cup final.